Previous we introduced ImageTrend Inc., a hosting and data management company. ImageTrend supports multiple sites running over 1000 VMs, with a wide variety of customer developed and off-the-shelf applications, including over 250 SQL instances. Their ageing Compellent SAN had begun to hamper their ability to grow and scale effectively, inspiring ImageTrend to invest in a Hyper-Converged infrastructure. In Microsoft Windows Storage Server 2012, with Storage Spaces and using the Scale out File System, they saw a cost effective way to provide the availability that their clients needed to succeed. One of the key reasons for the move to Microsoft Windows Server 2012 Storage Spaces was the ability to separate the SAN storage pools from the server running the Hypervisor and to utilizing dedicated Hyper-V Servers and dedicated SoFS servers on the CIB. Their previous SAN model tied their storage pools to their hypervisors hindering their ability to scale and requiring individual updates of every volume used by the VM. Microsoft’s SoFS makes it easy and fast to scale the number of VMs supported with low overhead. ImageTrend also experienced significant savings with DataON Storage’s CIB solution by eliminating the need for Dell/Compellent storage management software and lower capital expense. CIB provided an easy to deploy integrated platform that includes dual servers, redundant powers supplies, SSD and HDD storage and multiple networking options including InfiniBand and 10/40GbE RDMA (Remote Direct Memory Access) for maximizing network and storage connectivity via SMB (Server Message Block) transfers networking platform that unified management of all systems components with MSCS VMM, all to create a high availability cluster environment. DataON JBODs also provided additional high availability storage. Before starting to migrate to DataON Storage, ImageTrend had three Dell/Compellent SANs and were saddled with a SAN that would not scale and was driving higher OPEX. To date, they have decommissioned two of the Dell/Compellent SANs and grown their total data pool grow from 100TB to 300TB in the past two years using DataON Storage CIBs and JBODs. ImageTrend continues to plan for more growth. 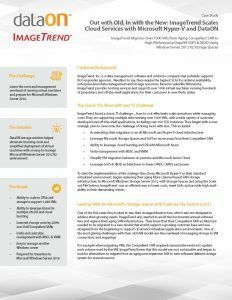 Join us next time as we cover ImageTrend’s results with DataON CIB and JBODs, as well as their plans for Microsoft 2016.